Hinduism has aspects of monotheism, polytheism, henotheism1 and kathenotheism2. The gods of Hinduism are also worshipped in different ways. Hinduism allows, simple, personalized worship of personal gods as well as elaborate rituals to propitiate them. One may directly approach the gods or through the mediation of priests. They may be worshipped physically, mentally or by both means. They may be worshipped according to the right hand methods and left hand methods. One may also worship the pleasant or fierce forms of the same deity. They may be worshipped for positive or negative ends, and for worldly or spiritual purposes. Devotees also enjoy the freedom to worship the formless, invisible, infinite God or the God with names and forms. Multiple traditions like Shaivism and Vaishnavism evolved overtime within Hinduism and flourished in the subcontinent as major sectarian traditions. Each of them has these features integrated into them from the beginning. The amalgamation of multiple philosophies and belief systems enriched Hinduism and made it colorful and vibrant. They added to its complexity and diversity and ensured its continuity, with unmistakable appeal to diverse groups of people. Today, Hindus worship numerous gods and goddesses. The gods may belong to different groups and live in different worlds, but they all belong to one large family (vasudaika kutmbam) and represent Brahman in their final essence. The Vedic religion constitutes the heart of Hinduism, since most of its beliefs are derived from it. However, the Hinduism which we practise today is much different from the Vedic religion which was practiced in the subcontinent two or three millenniums before. The Vedas contain numerous references to Vedic deities. They are called devas, the beings of light, purity and excellence. The Vedas proclaim them as one class of beings in contrast to humans, the celestial beings of the mid-region such as Yakshas, Gandharvas, etc., the animals, Asuras and others. All these are believed to be the children or grandchildren of Brahma, the creator god. They all seem to fit into a large family like unit, with Brahman as the head of the family and Brahma, Vishnu and Shiva as the eldest sons. The Devas live in the heaven. The Celestial beings occupy the mid-region. Humans, animals, insects, etc., live in the mortal world, and Asuras, the dark forces of the universe, live in the lower worlds. The early Vedic religion recognized only a four-tier universe. As time went by, the number of worlds kept increasing. The number is now uncertain. It can be anything from 14 lower and upper worlds to infinite worlds and universes of both gross and subtle kinds. Even in the mortal world, there are water-worlds and subterranean worlds where water beings, fabled snakes, etc., live. In addition to them, there are separate worlds for the triple gods (Trimurthis). Besides, the Shaktis (mother goddesses) have their own worlds. Thus, Vedic religion laid foundation to a complex universe of gods, goddesses, humans and other beings, each bound to certain dharma or obligatory duties as part of the universal order (rta). They are all connected by one thread, Brahman, who goes by innumerable names, who is not directly worshipped but who is considered the ultimate recipient of all worship and offerings..
Just as there are divisions and classes among people, the gods of Hinduism also fall into different categories. At the top of the pyramid is Brahman. Below him are the triple gods, Brahma, Vishnu and Shiva, and their consorts. The mid-tier is occupied by the Vedic gods, rulers of the directions (dikpalas), planetary gods, associate gods of the triple gods, their children and manifestations. Below them are great souls (siddhas), liberated souls (muktas), demi-gods, divine beings, celestial nymphs, guards, goblins and so on. At the bottom, there are animals, insects, worms, hells and beings of the dark worlds. The Hindu pantheon was not that complex during the Vedic period. People mainly worshipped the Vedic deities such as Indra, Agni, Varuna, Soma, Mitra, Vayu, etc. They performed sacrifices to propitiate the gods and made them offerings. The early Upanishads suggest that Asuras, gods and humans are children of Brahma Prajapathi, the creator god. He is also their divine teacher and the transmitter of the Vedas. Asuras were the first to manifest. Some scholars suggest that they were probably the original gods who degenerated into dark beings. We do not know how far this is true. However, we know that in Zoroastrianism gods are called Asuras, and the evil beings are named devas. We do not know what led to this fundamental difference between the two ancient traditions. According to the Vedic scriptures, the Asuras and Devas are eternal rivals. Both worship the triple gods, but in their own ways. The Asuras try to obtain divine powers from the triple gods for personal and selfish use and to create chaos. They are always at war with gods for supremacy. Gods help humans as long as they remain loyal to them and make them offerings. However, if they try to seek liberation or go above the gods, they try to disrupt their spiritual practice and cause them trouble. According to the Puranas the Devas became immortal in course of time due to a trickery played by the gods while Asuras remained vulnerable to death and destruction. The most popular gods of Vedic religion are Indra and Agni because the highest number of hymns in the four Vedas are addressed to them. They are followed by Soma, Surya and Vayu. Other important gods are Adityas, Aditi, Pusan, Rudras, Maruths, and Visvadevas. They are called gods of commonality because they were worshipped by common people. The total number of gods is uncertain because in Hinduism every aspect of Brahman is considered a divinity. Hence, in the creation of God even mountains, rivers, certain trees, animals, islands, stars, constellations, planets, organs in the body, divine cities, some sacred words, phrases, diagrams and geometric forms, certain mythical creatures, and divine objects such as conches and weapons are also worshipped as divinities. The Vedic deities are listed below in three major groups. This is not a standard classification, but for convenience only. The most important deities: They are invariably invoked in many sacrifices. Indra, Agni, Soma, Vayu, Varuna, Mitra, Surya, Pushan, Purusha, Rudra, Brihaspati, Vishnu, Brahmanaspati, Dyaus, Ushas, Savitr, Sarasvathi Yama, Parjanya, Vāc (speech) Vishvakarma, Manyu, Kapinjala, Adityas, Visvadevas, Asvins, Maruts, Rudras, Rbhus, Apris, Prithivi, Apas, Dadhikras. Minor deities: They are not so important but still revered in the Vedas. Bhaga, Atri, Apam Napat Kshetrapati, Manas (the mind), Dakshina (gifts), Ghrta, Nirrti, Asamati, Urvasi, Pururavas, Vena, Aranyani, Mayabheda Tarksya Tvastar Saranyu. River Ganga also appears in some hymns. Other deities: Some incarnations of Vishnu such as Varaha, Matsya, Narasimha, Krishna or Vasudeva are also worshipped as popular deities. They figure prominently in the later Vedic literature, especially the epics and the Puranas. The gods of the Vedas can also be classified into five categories according to the predominance of the elements (mahabhutas) and the gunas that are present in them. The elements are five namely fire, air, water, earth and space, which are responsible for materiality. The gunas are three, sattva, rajas and tamas, which are responsible for behavior and basic traits. Depending upon the situation, they may be present alone or in different permutations and combinations. For example, Agni, Apas, Prithvi, Vayu and Dyaus are made up of only one element. Agni contains only fire, Apas contains only water, Prithvi contains only earth, Vayu contains only air and Dyaus contains only space. Each of them possesses complete mastery over the element which they represent and may complement or neutralize the others. They are also present in the entire creation, including other gods, in different permutations and combinations. For example, Shiva has the predominance of fire and earth, but he has other elements too, which makes him a rather complex and powerful deity. He also has the predominance of Tamas, which along with the earth element keeps the negative aspects of fire (destructive power) under control, while the same fire under the influence of Sattva makes him the universal teacher and source of spiritual wisdom. Some gods may contain two elements, which may be equally dominant or one dominant and the other secondary. Others may contain three or four or five elements in varying degrees of dominance and dormancy. Thus, the presence and predominance of elements along with the gunas and their permutation and combination create the possibility of a great diversity of divinities in the universe with varying degrees of potency, divinity and essential nature. To this mixture, we have not even added the tattvas or the finite realities of Nature such as the senses, the mind, intelligence, etc. That would lead to even greater diversity. No wonder, the Hindu pantheon is so big and diverse, with millions of gods and celestial beings inhabiting countless worlds and spheres in innumerable universes. The process by which diversity manifests in creation is known as panchikarana. It is well explained in the following verse from the Paingala Upanishad (1.7). The popular saying is that Hindus worship thirty million deities. That number may be far-fetched, but it is true that Hindus worship numerous gods. In their final essence, they are but Brahman only and truly represent the unity and oneness of the whole creation. Brahman is one, but he projects himself as many. This is the truth which is repeated in several Upanishads. It is based upon three simple observations. Things cannot come out of nothing. There must be a cause for any effect to manifest. Eventually, all effects can be reduced to their causes. The third one requires further examination, because things are not what they appear to be. The distinction between cause and effect is rather superficial. All are causes only. Causes may fully or partially transform into effects, according to the need and situation. A cause may remain dormant or become the effect, which in turn may act as the cause of another effect. In other words, reality may be a series of causes and effects, or causes and causes only which appear to us as causes and effects. It is true, because nothing is definitive or determinative in the universe. Things are in a flux. One thing leads to another. Just as one action leads to another or one problem leads to another problem or solution or both, the succession of causes and effects produce the impermanent and illusory reality which we experience as life or existence or phenomena through our senses. According to the same logic, causes too can be further reduced into their causes. If we keep withdrawing the effects into their causes and such causes into their causes, eventually we arrive at a dead end, the cause of the causes. That the scriptures call Brahman, the creator and source of all. Indeed, we practice the same approach in yoga also. We withdraw the senses (effects) in the mind (cause), and the mind (effect) into the intelligence (cause) and the intelligence (effect) into the Self (the ultimate cause). It is then we experience oneness and supreme consciousness. The One manifests as many. Since the causes are hidden in the effects, Brahman is hidden in the things that arise from him, and each of them partakes his essential nature which may remain suppressed or expressed in different degrees. Those in whom Brahman naturally manifests in greater intensity, we call them gods and worship them because they are the closest to Brahman. Thus, the devas are the bearers and radiators of the light and heat (tapas) of Brahman. We cannot know him directly, but through them we can get a glimpse of him. The idea that Brahman is the source of all gods and in essence they are one is conveyed well in the Brihadaranyaka Upanishad (3.9) in a conversation between Yajnavalkya and Vidagdha Sakalya. According to the Upanishad, during a debate regarding Brahman which was organized by King Janaka on the occasion of a sacrificial ceremony Vidagdha Sakalya asked Yajnavalkya how many gods were there. Yajnavalkya replied that there were as many gods as the number of offerings were made in a sacrifice. That number was three hundred and three or three thousand and three, depending upon the type of sacrifice. Not satisfied with the answer, Sakalya asks again how many gods were really there. Yajnavalkya answered that the gods were thirty-three. Probably he was referring to another sacrifice in which only 33 offerings were made. Sakalya repeated the question. Yajnavalkya responded by saying six. Upon further questioning, he reduced the number to three, and finally to one. In the final analysis, Yajnavalkya was conveying the idea that all the gods, the three, the six, the thirty-three, the three hundred and three, and the three thousand and three were but manifestations of one supreme being. The same is true with the sacrifice also, as explained in many Upanishads and the Bhagavadgita. Although a typical Vedic sacrifice is complex and has diverse components, you can eventually reduce them all into a single entity, Brahman. He is the sacrificer, the sacrificed and the recipient of the sacrifice. The various offerings constitute food (annam), which is also an aspect of Brahman only. In the subsequent discussion between the two, Yajnavalkya listed the names of the 33 gods namely, the eight Vasus, eleven Rudras, and twelve Adityas, plus Indra and Prajapati. The eight Vasus were fire, earth, air, the mid-region, the sun, heaven, the moon and stars. They were Vasus because they were abodes (vasus) for the beings. The ten breaths in the body along with the mind constituted the eleven Rudras (the howling ones). The twelve months in the year (parts of the solar year) were Adityas, who are the solar deities. Indra was the thunder and Prajapathi was the sacrifice. The six gods were fire, earth, air the mid-region, the sun and heaven. The three worlds were the three gods. The one God was Brahman who was known as That (tyat). He was the essence of all other gods and their supporter. It is important to note that Yajnavalkya did not mention the deities as beings or entities but as aspects of creation. Instead of focusing upon their gross forms, he focused upon their subtle forms. The unity of creation is more evident in the subtle and deeper aspects of creation. If Brahman is the hub of the wheel of creation, the gods form part of the spokes of the wheel. The wheel is the body and soul (Brahman) is its center and support. Hence, it is assured in the Bhagavadgita that all paths lead to Brahman, and in whatever you may worship him, through any deity, name or form, all offerings ultimately reach him only. The basis of the caste system is the influence of the triple gunas. They are present in the whole creation, including the gods. Hence, they too are subject to divisions according to their essential nature. The Brihadaranyaka Upanishad (1.4.11) refers to caste based distinctions in the community of gods. Just as there are four caste divisions among humans, there are four distinct caste divisions among gods also. The prevalence of caste divisions among gods who are immortal and free from death and rebirth clearly proves that caste distinctions arise from the essential nature of people rather than their birth. Hence, the caste of a person should be determined by his personality and psychology rather than his birth or family status. According to the Upanishad, in the beginning, there was only Brahman. Then, he created upon earth men of excellent form, the Kshatriyas, having the power to rule. In the heaven, he created sovereign (Kshatriya) gods of similar nature namely, Indra, Varuna, Soma, Rudra, Parjanya, Yama, Death and Isana. Since, the Kshatriyas were first created, there is none higher than them. For this reason, in certain sacrificial ceremonies such as the Rajasuya, the Brahmanas worship Kshatriyas from a lower position. However, since Brahman is the source of Kshatriyas and their sovereign power, and since he is represented by the Brahmanas upon earth, the Kshatriyas have to seek the services of Brahmanas only to perform the sacrifices, besides supporting them and protecting them by all means and from possible harm. After the Kshatriyas, he created common people (Vaishyas) upon earth, and gods of commonality in heaven namely Vasus, Rudras, Adityas, Visvadevas and Maruts. Finally, he created the Sudras, the working people, and their god, Pusan, the nourisher. After creating the four classes, he created Dharma, which is superior even to the Kshatriyas. In a subsequent verse, it is stated that Brahman manifested as Brahmanas upon earth and as fire (Agni) in heaven. Since Brahman was found in both the forms, one should perform sacrifices with the help of Brahmanas only and make all the offering to Agni, the god of fire only. Indeed, fire is also a symbolic reference to the soul or Self. Hence, it is equated with Brahman. The Vedic gods are not totally free. Although they are immortal, they are not liberated souls but bound to certain duties and obligations just as humans upon earth. They were also created in such a way that they cannot live without the help of humans. Despite their immense powers and supernatural abilities, they have to depend upon humans for their nourishment. The Vedas declare that just as humans depend upon cattle and other animals for their nourishment, gods depend upon humans for food. Since they are helpless, humans have the obligation to perform daily sacrifices to nourish the gods. In turn, gods repay their debt by helping humans to fulfill their desires and prosper with progeny, peace and happiness. Thus, the relationship between gods and humans is symbiotic and mutually beneficial. Since the gods contain the predominance of sattva, they possess many divine qualities. On the positive side, they are benevolent, intelligent and fearless. They are also easy to please and readily help those who perform sacrifices and make them offerings by bestowing upon them knowledge, peace, prosperity and happiness and protecting them and the world from demonic influence. As part of the preservation of the worlds and Dharma, they also perform many duties such as guiding the souls who are on their way to ancestral heaven or the immortal heaven, making things auspicious, preventing natural calamities, removing misfortune and protecting people from their enemies. Whenever necessary, they participate in wars to fight the Asuras and prevent the worlds and beings from their evil influence. However, gods are not perfect beings. At times, they can be mischievous and even harmful. Because of the influence of the gunas, they possess mixed qualities. Indeed, In some respects they are no better than humans, if not worse. Although they are more advanced than humans and possess superior intelligence, like humans they also submit to desires, emotions, egoism, duality and attachment. Since they are pleasure loving and prone to enjoy life, they also frequently succumb to passions and lust. The Puranas contain many stories, which depict how Vedic gods indulge in indiscriminate acts and bring trouble upon themselves and others. Sometimes they do it to disturb the austerities of spiritual people and some times due to their own weaknesses and temptations. Also, they are not completely impartial. When their judgment is clouded, they take sides, make mistakes and suffer from attraction and aversion. Sometimes, they become involved in personal animosities not only against the Asuras but also their own kind and indulge in wars and conflicts. At times, they descend upon earth in disguise and deceive humans or steal things from them. They also succumb to pride and arrogance and try to show off. Although they are immortal and powerful, they are not immune to spells and curses. Many gods were cursed by seers and sages in the past for their indiscretions and had to perform penance to escape from them. Thus, while gods may have their own justification to indulge in such actions, and while the scriptures may justify or rationalize them as part of God’s divine play (lila), it is difficult to say that the gods are completely virtuous or righteous. You cannot take them for granted, nor can you always bank upon their generosity. They have their own moods, compulsions, limitations, likes and dislikes. Just as the human beings act unpredictably under the influence of the triple gunas, they too engage in desire-ridden actions and impulsive behavior. Hence, one has to be careful while dealing with them and approach them at the right time in a right manner. It is why Vedic sacrificial ceremonies are performed strictly according to the procedure as laid down in the scriptures and after choosing the right time and place according to the Vedic calendar. It is also why each sacrifice or ritual worship is concluded with an expiation ceremony to atone for the mistakes that may have been intentionally or unintentionally committed during the sacrifice. Besides, we cannot afford to displease the gods or fail to serve them. We depend upon them for various types of help. They play an important role in the order and regularity of our world. They keep the balance between order and chaos and between the positive and negative forces of the universe. Because of them the rains fall, the rivers flow, the crops grow and the souls reincarnate. Without them, the world will fall into chaos. We cannot uphold our own dharma. Hence, the gods truly deserve our respect and support. Although Hinduism retained many aspects of the Vedic religion, for reasons not known to us, the Hindu pantheon underwent considerable changes during the later Vedic period. The gods who were objects of highest adulation and worship in the Vedic sacrificial ceremonies lost their importance and their exalted status in the hierarchy of gods. At the same time, gods such as Vishnu, Shiva and Skanda gained prominence. The Vedic gods were reduced to planetary gods (grahas) and rulers of directions (dikpalas). In the Rigvedic hymns, Indra was an invincible warrior, feared by his foes. However, in the subsequent literature he seems to have lost much of his battle prowess. Although he and his companions were still at war with the Asuras, they are no more invincible or feared. Similar fate awaited Varuna, the god of rains and the ordainer of laws whom the worshippers feared to disobey in the Vedic times. The Puranas depict them as dependent gods who rely upon the triple gods and their involvement to defeat their enemies or protect their sovereignty. A similar fate awaited Brahma, the ordainer of the fate of all. Although he enjoyed an exalted position as part of the Hindu Trinity, he was reduced to a mere attendant god in the affairs of Shiva and Vishnu and excluded from domestic worship. Most of his incarnations and attributes were passed on to Vishnu and he was projected as the first god to arise from the navel of Vishnu at the beginning of each cycle of creation. From being the Isvara or Purusha of the Rigveda, he became Viraj, his material manifestation. His demoted status in the pantheon is symbolically represented in the Puranas by depicting him as the god who lost his fifth head in the hands of Shiva and thereby his omniscience. Even today, there are very few temples in India which are dedicated to Brahma whereas the number of temples and shrines for Vishnu and Shiva are in hundreds of thousands. The status of other Vedic gods such as Indra, Varuna, Mitra, Soma, etc., declined even more. Except for Surya, these gods do not have temples of their own. They are worshipped mainly as part of an elaborate Vedic ritual or sacrifice. They are remembered during the recitation of peace mantras and introductory hymns on auspicious occasions and during ritual worship at homes and in temples. On such occasions also, the attention and fervor are predominantly diverted to the principal deity who may be Vishnu, Shiva, Shakti, or one of their numerous aspects. It is unclear what led to the decline of the Vedic deities. Although Vedic religion prevailed and many Vedic beliefs and methods of worship became integrated into Hinduism as its predominant aspect, Vedic gods somehow lost their exalted position and become secondary in the Hindu pantheon. The gods exist both in the macrocosm of the universe and the microcosm of a being. They exist in creation as an idea or a force and gather energy and momentum according to the offerings they receive. They have no definite form. Hence, in whatever way we worship them, they manifest. They manifest in our lives and destinies according to our devotion. If they are frequently remembered, honored and worshipped, they exert greater influence upon our lives and bestow gifts and boons. If they are not remembered or worshipped, they will gradually fade from our memory and withdraw from our consciousness. In the body, the food which we eat becomes the offering to the gods who reside in the organs. If the food is pure, the gods grow in strength. If it is impure, they become malnourished and withdraw. Hence, our tradition emphasizes the importance of pure (sattvic) food, which is dearer to gods. Same is the case with the thoughts we entertain. If we think good thoughts, the gods grow stronger in our consciousness. If we feel positive emotions, they feel happy. On the other hand, if we think impure thoughts or succumb to negative emotions, they become silent and stop responding to our prayers. Therefore, it is important that we not only worship gods but also practice virtue to keep our minds and bodies pure. It is not necessary that humans worship the same gods all the time. The preferences and practices of divine worship keep changing as the world progresses from one epoch to another. It may happen because in certain ages the participation of some divinities may become necessary for the destiny of the earth or the liberation of beings. Alternatively, their services may be no more required. For example, Lord Rama appeared in the Treta Yuga to protect the world from Ravana, while Krishna appeared in the Dwapara Yuga to restore Dharma and finish the work which was begun by Parashurama. In Kali yuga, the gods in whom the fierce from of Shakti is more active are more popular. This was alluded by Sri Aurobindo in his writings who stated that we worship those gods who descend from heaven in to the earth consciousness and become active in our minds and bodies. They descend into our inner worlds and planes of consciousness to perform certain transformative tasks according to our aspiration, degree of surrender and devotion. When it happens, it is necessary that we remain passive, giving up all willful effort, and allow them to do the work, without interfering with the process. Once the mission is accomplished, they would either withdraw or become passive. When they are no more required by the humans, they will withdraw forever from the earth consciousness. Therefore, it is not uncommon for some gods to fade from our memories and entirely disappear from our consciousness and that of the planet. It may happen because of changes brought by time, or due to the improvement or decline of the collective fate, karma, Dharma and spirituality of the humanity. The Vedas speak of ancient gods of previous time cycles who presided over a great sacrifice, which was performed in the beginning of creation by the Purusha, the Cosmic Being, using parts of himself. We do not know who those gods are, but they seem to reside in the remote echelons of the heaven. They are so distant that we do not feel them or know them. They may probably be active in some other worlds or preparing our world for the events that are yet to happen. Undoubtedly, gods do shape our destinies and that of our world. They also can intervene with our fate and neutralize our karmas. At the same time, their fate and destinies may fluctuate due to various reasons. The Vedas also allude to fluctuating fate of the gods in each time cycle according to their past karma and accomplishments. The whole of God’s creation is defined by impermanence, not just our mortal world. Since the higher worlds may have longer days and nights, things may exist there for a longer duration, but nothing lasts forever. Except Brahman, no one else’s position, name or status is secure or permanent in creation. So is the case with our knowledge of the worlds and gods. We have seen how the Vedic pantheon underwent changes in the long history of Hinduism and how some gods lost their importance while some gained prominence. It might not have happened by accident. As times change and people change, they would look for deities who would command their love, attention and respect. Primitive people might have worshipped gods whom they feared. In todays' world people like to worship gods who personify love, virtue, compassion, tolerance and forgiveness. Just as our knowledge increases our notion , idea or conception of gods may also change. In today's world a majority of people do not like to worship gods who demand human or animal sacrifices for appeasement. Hence, those gods either fade from our memory or assume newer and more acceptable identities. History shows that gods may became known by different names in different periods, or gain wider social acceptance and following. For example, gods such as Ganesha, Hanuman and Ayyappa are more popular today than many traditional gods. They were relatively unknown in the Vedic period. It is possible that as people become more spiritual, wiser and knowledgeable, new gods may descend into earth consciousness in future to help them. Alternatively, if the world declines into chaos, fierce gods may appear to restore dharma. The Vedic deities are not only forces of nature, but also forces that exist in the physical bodies of the beings as organs and subtle entities. They participate in the circulation of breath, digestion of food, transmigration of souls and the spiritual transformation and liberation of beings. From the Vedic perspective, the human body is a replica of God’s universal form. All the worlds and divinities who are present in creation are also hidden in the human personality. Therefore, it is the key to enter the eternal world of Brahman. The way to Brahman is not in front of you or in any temple. It is within you, and it becomes known only when you look within yourself. The symbolic significance of the Vedic deities was discussed in detail by Shri Aurobindo in his book entitled, "The Secret of the Vedas." The views expressed here are based upon his interpretation. According to him, the Vedas are not mere books of rituals but contain a lot of hidden symbolism. Therefore, one should not regard the Vedic imagery as mere poetic expression or literary indulgence. The gods, goddesses and the demons who are mentioned in the Vedas represent various cosmic powers. They play a significant role in the drama of creation both in the external and the internal world of humans. The divinities may remain active or dormant in humans according to their spiritual state. When a person is on the path of liberation, he must focus upon invoking certain gods within himself so that they become active in his consciousness and help him in his transformation and progress. In other words, if you are aiming for spiritual transformation, you should not strive to accomplish it on your own. You should rather pray to the divinities, especially the Mother Goddess, invoke them and let them do the work, while you remain passive, in an aspirational state of surrender and devotion. It means, the mind and the body, which constitute the field (kshetra) of the soul must be prepared, just as a farmer would prepare the agricultural land before sowing the crop. You cannot do it unless you have faith and willingness to let go of intent and purpose and readiness to embrace uncertainty. It is what we call true sanyasa, living without effort and striving. The divinities who reside within the being must be strengthened through prayers and proper nourishment so that they will remove the impurities and darkness from the “physical being and consciousness” and protect it from demonic influence. Sri Aurobindo also spoke about ritual symbolism and the significance of internal sacrifice, which is similar in its structure, form and intent to the external sacrifice, the Yajna. He suggested that the outer form of a Vedic ritual has an inner corresponding ritual. Each Vedic ritual is a sacrifice, an attempt to fulfill the purpose of creation and elevate the status of man to that of a godhead or a cosmic man. In that ritual, at the inner level, Agni is the divine spark or the inner soul. The ghee or the clarified butter which is offered to him during the sacrifice is the mind. The sacrificial food (annam), consisting of food grains, etc., constitute the physical body, which is made up of food only (annamaya-kosa). When the divine spark (Agni) is ignited through spiritual effort, he wakes up all the latent energies or divine powers that are present in the body (the subtle aspects of various gods and goddesses) and invites them to share the fruit of the sacrifice. Once they are nourished and satisfied, they assist the host of the sacrifice in his spiritual awakening, transformation, and purification. The symbolic significance of the Vedic gods is further explained by him in the following manner. Indra is the awakened mind or the illumined mind. 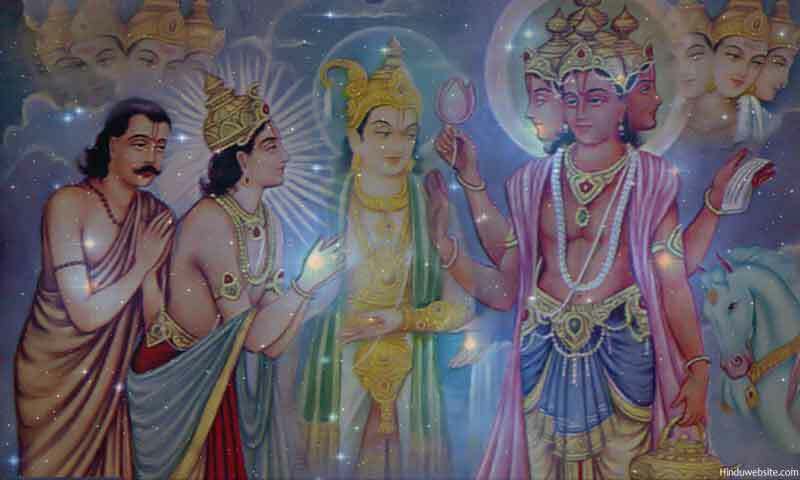 In the cosmos, he appears as the lord of the heavens, who rules over the gods from his capital city, Amaravathi. In body, he manifests as the mind and acts as the lord of the senses. They represent the divinities, or the followers of Indra. Just as the gods, they have the propensity to seek pleasure and avoid pain. According to the Vedas, once he slew the demon, Vrata and released the cows (waters) which he held in captive in a dark cave (dark clouds) so that they would descend to the earth (rain fall) to deliver the parched earth from hunger and death. Internally, Vrata the snake demon symbolizes desires, ignorance and impurities of the mind. They hold the rays of truth, knowledge and wisdom (cows) in captivity in the caves of sense-driven life (panis) and cloud our consciousness. One can escape from that predicament by cleansing the mind and body and releasing the attachments. The legend of Indra and Vrata convey the hidden message that death and rebirth can be overcome only by restraining the senses with the help of Indra, the lord of the senses, and overcoming desires and attachments. The Rudras and the Maruts who are extolled in the Vedas as storm gods are the positive forces which aid Indra in his fight against the evil forces. They disperse the dark clouds (impurities) and clear the sky (the consciousness). The Ribhus are the seasons. They represent the stages through which a person has to pass in his spiritual practice to attain perfection. When the senses are withdrawn into the mind and the mind is stabilized in the contemplation of God, after removing all the impurities that are present in it, one experiences the inner awakening, the dawn of Ushas, the goddess of dawn and the sister of the Sun (Surya). She rises from the ocean of consciousness as a bright maiden along with the twin Asvins, light and heat. The Asvins are the divine doctors who can cure all types of spiritual illnesses by infusing spiritual energy into the body. They symbolize the energies (tapah and tejas) which purify the mind and body and prepare them for the rigors of spiritual practice. After Ushas appears Aditi, the mother of gods. She is followed by the Primal Sun or the god of light who manifests as Savitr, the early morning sun. He represents the divine grace which is essential for spiritual success. Then he becomes Mitra, who symbolizes divine love. He is a friend of the illumined mind (Indra) and his companions. The next in line to appear are Rta and Rta-chit. They are truth in action and truth consciousness who are responsible for the orderly progression of the day and the world. Various Goddesses also appear at this stage, Ila (the goddess of Truth Vision), Saraswathi (the goddess of knowledge and wisdom), Sarama (the intuitive mind) and Dakshina (the goddess of discernment and ability). Thus, we can see that the Vedas symbolize the truths of existence through archaic symbols and imagery. Outwardly, they may appear as books of rituals, but internally they contain a lot of hidden content. Just like the imagery of our dreams, we need a key to decipher them and understand them. The idea of sacrifice dominates the Vedic thought. It is also central to Vedic symbolism. The structure of the sacrifice is hidden in various aspects and forms of creation. Therefore, by understanding it one can unravel the mysteries of existence and know the path to liberation. Life itself is a sacrifice in which the jiva (living being) is both the sacrificer and the sacrificed. In that sacrifice, his actions become the offerings and the fruit of the karma which arises from them becomes the remains of the sacrifice. The gods who reside in us feast upon those offerings (actions) and reward us suitably according to their merit. 1. The word Henotheism was originally coined by Friedrich Schelling and used by Friedrich Welcker to denote the primordial monotheism of the ancient Greeks. It is the belief and worship of a single god while accepting the existence or possible existence of other deities. 2. The term kathenotheism was coined by Max Muller in 1865 to define Vedic religion. It denotes the belief system which acknowledges the existences of multiple gods but considers each the highest and supreme, in contrast to monotheism which acknowledges only one God and polytheism which recognizes multiple gods.